Chrysorrhoas (Zlatostruy) is an Old Bulgarian collection of John Chrysostom’s homilies. It didn’t reach us as an entity in certain manuscript(s), but in several different witnesses, known among the paleoslavists as “redactions” – miscellanies with stable content, that used independently from each other the initial (now lost) protocollection. The most important source for studying Chrysorrhoas is the longer collection (“entire/full redaction”). Here, in the famous Preface (Prilog’), the initiative for constituting the corpus is ascribed to the Bulgarian King Symeon (893–927): he read all the books of Chrysostom and, astonished by his wisdom, selected the homilies to be translated. 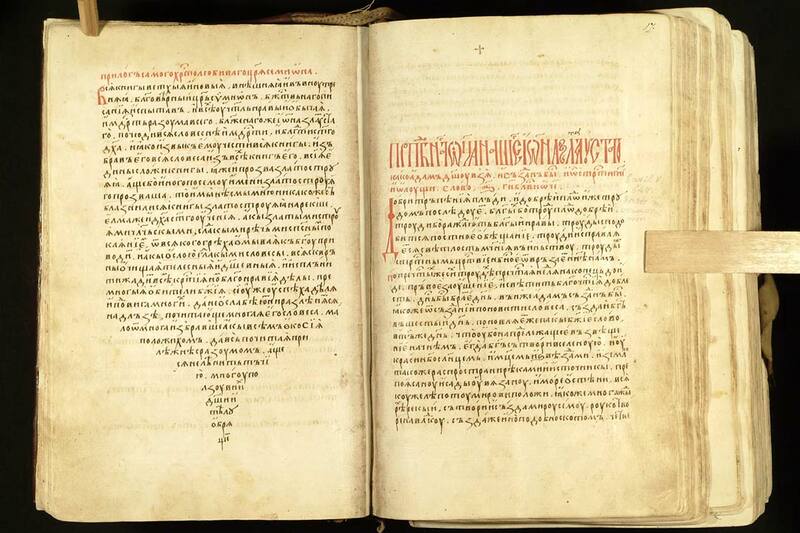 from MS RGB-Moscow, Russia, MDA, f. 173.I, № 43, 1474, ff. 16v-17r. Thus Chrysorrhoas collection becomes a key evidence for adoption of Byzantine models among Slavs, all the more that copies of its “redactions” and of certain homilies from its contents have had a long tradition in Russia, Serbia, Mount Athos as late as 18th c.
This is why Chrysorrhoas holds special position in developing our database and it is of a primary interest for our team not only as subject of cataloguing but also as a work, offering opportunities for fruitful research.